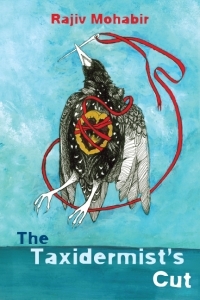 The Taxidermist’s Cut is the winner of the 2014 Four Way Books Intro Prize in Poetry and a finalist for Lambda Literary’s 29th Annual Award in Gay Poetry. The Taxidermist’s Cut inhabits the experience of a queer brown youth awakening sexually in a racist, anti-immigrant matrix. As an Indo-Caribbean, the queer-countried speaker is illegible as an “Indian” as well as an “American.” Haunted by his migration narrative, the speaker must survive a palimpsest of violence: violences enacted upon him both by himself and others. This is a collection of twisted love stories-as-slits that exposes the meat and bone of trauma and relief. Mohabir draws from source texts such as animal tracking guides and taxidermy manuals to highlight themes of discovery, preservation, and survival on all fronts. of palmettos and sand pines. Today: the odium of salt and pheromones. "In his excellent debut, Mohabir exposes desire and inner turmoil through the measured incantations of a queer, Indian-American voice that refuses the burdens of a homophobic and racist world. He eloquently describes how the brown body survives, clinging vigilantly to longing, lust, and love..." - Publishers Weekly, April 2016 Read the full review. "...Mohabir’s The Taxidermist’s Cut is a collection of destruction and reconstruction, and we the readers are left among the moonlit ruins, with a strange ache of recognition." — Kenji C. Liu Read the full review. "...the 'fairytale' takes on a darker meaning here, as our lyric speaker finds himself remade into something perhaps both majestic and grotesque at the same time. The Taxidermist’s Cut is a collection that revels in making meaning out of poetic dissonances." —Asian American Literature Fans Read the full review. "...This is the sort of turn that speaks to how deft a poet Mohabir is, how skillfully he works the taut space between figure and figured, between tenor and vehicle. He is a technician of elaborate metaphor but deployed here not to mask or soften the complexities of power between lovers, between dominant and subaltern bodies and cultures...." — Kenyon Review Read the full review. "In The Taxidermist’s Cut, Rajiv Mohabir’s lines, both sinister and lovely, function as cuts that reveal and divide, shimmering with the erotics of violence. Transfixed, one finds oneself unable to look away, arrested by the elegance of the language and the way, when held to the skin, it causes the body to shiver with pleasure...." — Lantern Review Read the full review. "...The poems in The Taxidermist’s Cut shimmer and shudder, and they deserve to be celebrated. Rajiv Mohabir is a brave poet. He’s armed with a razor and a map of the heart." — Poetry Witch Read the full review. "Mohabir’s debut is a wonder and a sorrow. He matches lyricism with deft narration, interweaving other texts with his own work exquisitely and harrowingly. A haunting collage, The Taxidermist’s Cut feels at once timely in its honest, vulnerable exposition of race and sexuality, and ancient, in its foundation in myth and the natural world. "— Gravel Mag Read the full review. "The sometimes grisly art of taxidermy, in which death is cleverly disguised as life, serves as a dominant metaphor for poems that explore everything from 'Homosexual Interracial Dating in the South' to the poet’s 'chutney / of Creole and Hindi' to creatures as disparate as the whale shark and the cicada. "— The Santa Barbara IndependentRead the full review. "...Mohabir’s erasure poems shave and re-stitch a guide to taxidermy to demonstrate the violence of taking parts for the whole, asking readers to strip off their skin and step into another’s. "— The Arkansas InternationalRead the full review. "...Through his accomplished craft and thoughtful approach to style, Mohabir shows us the myriad ways that censorship and the fear, deeply rooted in our culture, of confronting difficult questions, is gradually internalized, shaping one’s conscious experience even in solitude. This, Mohabir shows us, is the ultimate form of violence and intrusion...."